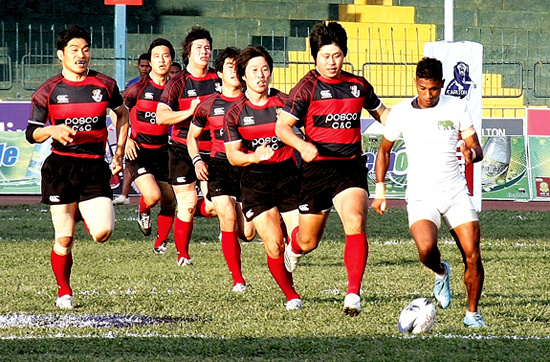 A fourteen minutes blitz by Sri Lanka brought down a fancied South Korean outfit as the Lankans entered the quarter finals with a 22 points (1 goal, 3 tries) to 12 (1 goal, 1 try) win at the Carlton International Rugby 7’s 2009 Asia Pool `Cup’ match at the Sugathadasa Stadium yesterday. CRICKET: Bangladesh created a piece of history for themselves when they became the first team to register a win at the newly opened Pallekelle Cricket Stadium by defeating Sri Lanka in a ‘warm up’ under-19 junior match played at Pallekelle on Friday. CRICKET: Dynamic all rounder and opening batsman Jeevantha Kulatunga slammed a sparkling 158 with five sixes and 15 boundaries to put Colts CC well on course to an outright victory over Saracens SC on the second day of their SLC Premier League Tier ‘A’ cricket tournament match continued at Havelock Park yesterday. Wanted Grand Masters for Chess!